Yeah, but: Choose which of your children will inherit it. 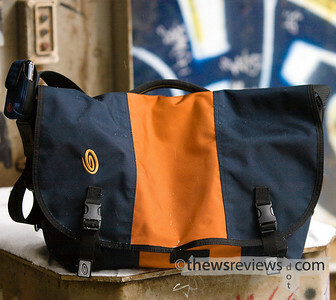 The Long Version: Timbuk2 has been making messenger bags for a while now, and they've gotten pretty good at it. I've liked their bags for some time, but I needed to work my way up to buying one. The deciding factor was that Penny and I have this running competition to see who owns more bags, and this one really put me out in front. A large customized T2 counts for double. 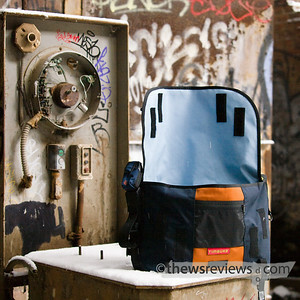 Seriously, I ran into some difficulty with my Seal Line Urban bag, which I now consider my 'summer' carryall. It's very nice, but when slush season came I needed something large enough to carry a pair of indoor shoes. The theme of needing a bigger bag than the one that just barely fit my stuff wasn't a new one, and when I needed to solve this particular problem for my camera gear it worked out rather well. So I applied the same logic and went for a really big bag. A really, really big bag. This is the "Large" size, with a rated volume of 35 liters. To give a sense of scale, that's an American-sized office chair that the T2 bag is sitting on. Inside is a week's worth of supplies, including a box of 8 frozen 6oz steaks,two kilos of rice, and a 2L bottle of laundry detergent. It's actually been a challenge to find things that won't fit; I've used this bag to pack enough clothes for a four-day trip. The lunch bag that fits nicely in my 16L Seal Line bag will fit sideways in this one, with enough room left over to carry my winter boots and two water bottles, along with my flashlight, sunglasses, and little camera. The double-wall construction has a waterproof liner under the ballistic nylon outer shell, but it's flexible and will change its shape to fit awkward stuff. Its size is almost a liability, as it can be hard to get into it past the large semi-floppy lid. 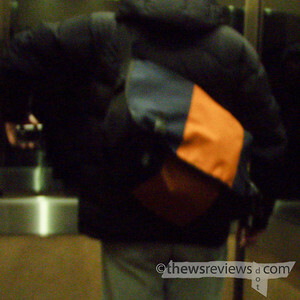 (Lengthening the strap when I need to get into the bag makes all the difference.) When emptyish the bag is very form-fitting, and when full it's quite bulky, but I've never felt like it couldn't do what I wanted it to do. The only caution is that there's no padding in the bag, so I needed to learn how to load it to prevent things from poking into my back. I used the Build Your Own Bag option to get a custom colour scheme as well as a couple of other options not available in stores. My colours are Navy-Copper-Navy, with the logo also in Copper. You'll notice that the logo and the centre panel don't quite match, which is not unreasonable considering that they're completely different materials. 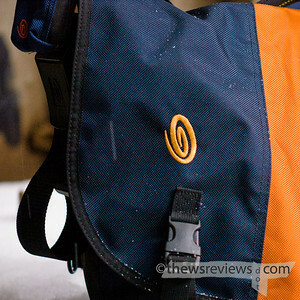 Other additions are the grab handle at the top of the bag, which is only standard on their computer messenger bags, and the badly-named Center Divider. In the Large bag this is a pair of fabric panels that are stitched into the seam along the back of the bag; the panels are joined in the middle by a velcro spot, giving two thin full-length 'slots' to put things. It doesn't divide the width of the main space or cross the centre of the bag, but it does provide a place to put books, papers, or other items to keep them separate from the main cargo area. 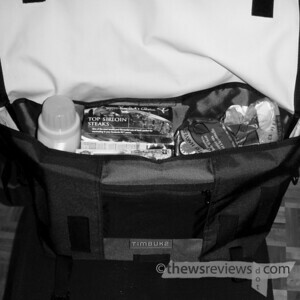 In short, it's the back panel visible at the back of the bag in the monochrome grocery shot above. I also chose a light blue liner to go with the Navy exterior. The other build-to-order option that I chose is a left-handed bag. This took a great deal of puzzling for me to figure out, and I'm still not quite sure I wasn't just lucky to get what I did. The website's description is: "Right Handed: Design the bag to be worn over your left shoulder / Left Handed: Design the bag to be worn over your right shoulder". The picture of the bag on the T2 BYOB page doesn't change when the choice is toggled, and there's no explanation of what the difference is. I eventually chose the left-handed option, and got it right. The left-handed/right-shouldered choice puts the strap's cam-lock length adjustment on the side of the bag that faces forward when the bag is worn on my left hip - the side with the logo. This makes it easy to lengthen the bag while I'm wearing it, which is essential for easier access, as well as snugging the bag up for a more comfortable carrying position. The T2 website (and my Seal Line bag) both have this adjuster on the right side, so I suspected that this was the 'normal' configuration. I wear messenger bags on the opposite shoulder from most people that I see, so I figured that I needed the other one from the default setting on the BYOB page. Whether it was a brilliant insight or just luck that led me to get the correct one is irrelevant: the 'handedness' of the bag makes a difference, and the BYOB process doesn't make it very clear. Of course, I could have just asked Timbuk2 my questions instead of risking getting an expensive and non-returnable bag wrong. The customer service team (let's call him Tim) was awesome when I had a question about shipping, getting me exactly what I needed to know and then going beyond that to do my follow-up research for me. He was very quick and friendly, and actually read my e-mail. (You wouldn't think that's remarkable, but the one time I needed support from the vaunted B&H Photo, they were snippy and clearly couldn't be bothered to read, let alone answer, any of my questions.) I continued to be impressed by how quickly the bag was put together and shipped, and when it arrived the colours looked exactly like I expected it to. That's a significant accomplishment even in a printed catalog, and while I do have a colour-calibrated monitor, it was more than I expected from web colours. The other add-ons I chose was a fancy-scmancy Tough-Tek strap pad, which adds some cushioning to the strap and grips very well on my jacket, but doesn't stop the bag from being able to be slid into position. I picked up two cell phone holders, one for me and one for Penny, because these are the only ones that I've seen that are designed to attach in-line with the strap. The one you see in these photos is the Medium in Navy, but I've used an orange marker to make the grey logo into closer match to the one on my bag. I also bought the Medium sized Two-Way gadget holder, which also attaches along the strap, making it perfect for carrying my P&S camera or a larger phone that may arrive when I finally drop my current service provider and the nasty little Motorola Razr V3 that I loathe. But I digress. Buying my T2 bag was the result of a loud snapping sound: I wanted the mother of all bags, one big enough to do anything I wanted it to, and tough enough to last until I was too old to wear it. I don't drive, so my kick scooter, walking, and public transit are my chosen ways to get around the city, and this means that I need a good bag to replace a trunk and glove box. I'm also making an effort to reduce the number of plastic bags that I use - millions of square kilometers of the world's oceans are covered in plastic garbage - and having a bag with the phenomenal flexibility of the Large T2 bag has really helped that. After more than a month of solid and varied use, I don't have a single complaint about this bag. The T2 website does seem to change on a regular basis, so if there's an option that you want but don't see, wait a bit or send them an e-mail to ask about it. I would have taken the signature reflector tails on my bag, but only the tabs were offered when I ordered. They also seem to like having promotions and sales, so it's great for impulse shoppers. While I don't imagine I'll need another bag for a very long time - I'm trying to ignore the "want" possibility - it seems like there are many people who like their T2 bag so much that they start collecting them. That's all I need - more bags.